The College of Eastern Utah lady Eagles are 1-2 after a win over Colorado Northwestern and two hard losses from Snow and SLCC on the road last weekend. “This might be the best Colorado [Northwestern Community College] team in years, their strength is in three-point shooting, against us they hit 16-three pointers. Their weakness is in the post, they don’t have much size,” said lady Eagles Head Coach Dave Paur, after last Tuesday’s 84-70 home win over CNCC. Paur said that our strength is in our post play Kaylie Robisson is again leading the team in rebounding and scoring. “Our weakness so far is three-point shooting,” Paur added. Robison had 11 rebounds, 22 points, and two assists. Stacey Stringham had 14 points, seven rebounds and one assist. Livnat Alon had 13 points, four rebounds and three assists. And Bruna Deichmann had 12 points, one rebound and one assist against the Spartans. This win put CEU at number five in the Scenic West Athletic Conference standings, and CNCC at number six, with a record of 0-3. 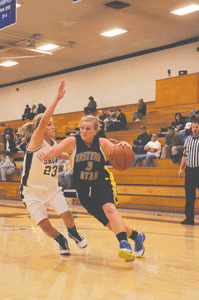 The Lady Eagles suffered the first of their two losses in Ephraim at Snow College last Friday night. The women played a strong game, but came up short in the 68-57 loss to the SC Badgers. The win put Snow at number two in the conference standings with a record of 2-2. Diechmann and Robison were the leading scorers in the game. Deichmann racked up 19 points, and two rebounds and two assists. Robison scored 15 points with pulled in eight rebounds. The last of the Eagles losses was at the hands of the no. 2 team in the nation, the SLCC Bruins on Saturday on its Taylorsville campus. Despite CEU playing hard, they were not able to overcome the 11-point loss to the Bruins, 85-74. That victory put SLCC number one in the SWAC conference standiing at 4-0. The leading scorers of Saturday s game were Robison with 20 points and 10 rebounds. Savana Gines with 16 points and two assists. Deichmann added 12 points, two rebounds and two assists. The Lady Eagles are hoping to redeem themselves and break their two-game losing streak this weekend. Students are asked to show Eagle Pride and come to support them this Friday at 5:30 p.m. in the Bunnel-Dmitrich Athletic Center, as they go head to head with the College of Southern Idaho. CSI is currently ranked number four in the conference standings, with a record of 1-1. On Saturday at 3 p.m. in the BDAC, they battle the number-three ranked North Idaho College Cardinals. Students with ID cards are admitted to the games free of charge.